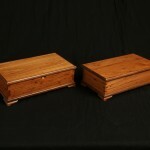 These two box’s were designed after two blanket chest i design for them. 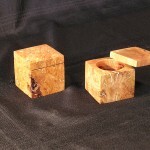 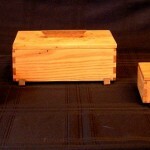 One is male with dovetails corners and the female has slip feather joinery in the corners. 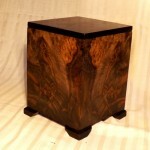 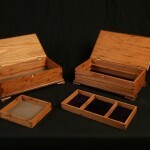 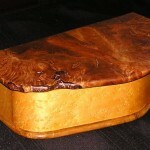 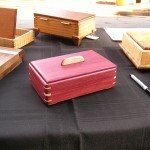 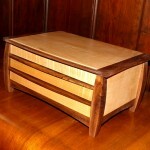 4 jewelry box’s were commissioned two male and two female for Christmas gifts after the same design as the blanket chest I was commission to do. 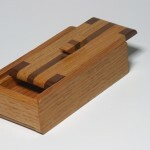 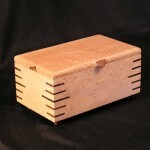 Wood: American Wormy Chestnut The Female design has a lift out lid with compartments where the male has half a lift out to accommodate cell phone, wallet, watch and so forth. 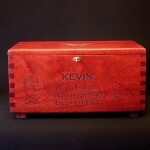 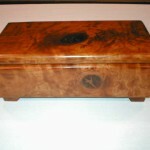 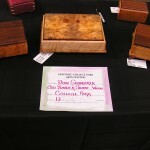 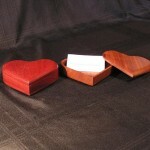 Kevin’s Urn Wood: Mahogany Joinery: Dove Tail Features: legs, lock, carving Size: 8″ tall x 12″ long x 8″ deep Finish: Red Stain with Clear oil hand rubbed.